Believe it or not, I've actually gotten back into my cooking grove this month! I'm completely recovered from my cesarean and sitting on dozens of photographs of many yummy things. All I need to do is settle down at my laptop and do a little blogging. Of course, that is easier said than done when you have two small children; the oldest tearing through the house as I clean up behind her and the baby pondering which end of his will feature some spectacular eruption. Then of course there is the laundry, of which I am pretty sure generates through some sort of binary fission since it is endless. How do large families keep up with that anyway! My mother, who recently moved here from the UK and took a job in Seattle, was going help with all this and the blogging, as I mentioned some weeks ago. She was very excited about the idea of food blogging and had several excellent ideas. However, I think she realized how much work is actually involved when juggling life, diapers and mixing bowls (NOT hygienic, don't do that!) and rather than spending her vacation doing that, she took off to Spain... and then Hawaii. Now let us abruptly transition into the food blogging part of today's post! Today's dish is a sinfully rich honey-vanilla custard ice cream, swirled with ribbons of honey. Simple, delicate and delicious. The flavors meld in the mouth with delicate floral, vanilla, caramel notes. Good stuff. On a hot summer day try tossing a scoop into a glass of cherry soda. Really good stuff. The type of honey you use is up to your own personal tastes. A medium to bold flavored honey is a good choice for this ice cream. Using a single source honey such as clover, orange blossom or leatherwood will allow you to play with the flavor notes of the final ice cream. Let's get down to the recipe. Now, you will notice I served the ice cream with cookies. These are simple short-cookies, packed with orange zest and nutmeg. Since I photographed them with the ice cream, I'll include the recipe and instructions for them as well with this post. In a medium-sized heavy-bottomed sauce pan, combine the cream, milk, vanilla bean paste or vanilla bean (split and seeds removed, with seeds and pod added to the pot), salt and the 3/4 cup of the honey and bring to a bare simmer, stirring frequently over medium high heat. Meanwhile whisk together the egg yolks and sugar. When the milk and cream mixture is hot, remove from heat and add one cup to the egg mixture in a thin stream, whisking constantly. Return the egg-cream mixture to the pot and place back on the stove at medium heat. Cook, stirring constantly until the mixture begins to give off steam and reaches 170°F. If you don't have a thermometer handy, simply swipe your finger across the back of a spoon that has been dipped in the mixture. If the stripe left by your finger remains with clean edges, it is done. If it blurs, continue to cook until the mixture has thickened slightly and try again. When done, remove the split vanilla bean pod (if using) and strain the mixture into a large bowl. Cover and refrigerate until very cold (ideally overnight). Then churn according to the instructions on your ice cream maker. Once churned, transfer the ice cream to your freezing container, layering the fresh churned ice cream with large spoonfuls of the remaining 1/2 cup of honey. Freeze until firm and then serve. Dress up the dessert with a drizzle of your best honey and, if you desire, some of these simple orange-nutmeg tea cookies. In a bowl, whisk together flour, salt and nutmeg. In the bowl of your stand mixer, cream the butter and sugar on medium-high speed until light and fluffy (approximately 5 minutes). Beat in the egg and orange zest and then reduce speed to low. Add the flour mixture and mix on low speed until just combined. Chill the dough until firm for easier handling. When firm, shape the dough into a long loaf (roughly 1 1/2" high and 3" wide). You may also form a cylinder if you prefer round cookies. Brush lightly with beaten egg and then coat with well Turbinado sugar. Wrap the loaf tightly with wax paper and then chill for a minimum of 2 hours or up to 3 days before baking. When ready to bake, preheat your oven to 350°F. Slice the loaf into pieces and arrange on a baking sheet lined with parchment or silicone baking mats. Bake for 20-25 minutes until light golden brown with darker edges. Ohhh, this all sounds delicious! I'm drooling! I want you to know that my trips to Hawaii and Spain were purely altruistic. I was doing research for possible future posts on your blog. I had to sacrifice myself and eat a lot more food than I would normally - in very beautiful settings - all for the sake of research. (I also had to dance late into the night on some evenings to work off all of that food which was just part of the whole package of self-sacrifice I went through.) Where do you think I came up with that Kona coffee BBQ sauce I'm working on? I also want you to know that I took detailed notes about all of this amazing food on these selfless trips. Unfortunately I can't read the notes because my Bain de Soleil SPF 8 spilled in my bag. I have realized that you have more patience than I when it comes to blogging. I like to cook the food then EAT it. Photos and writing? What a hassle; let's do that later. Pass me the ice cream before it melts. A kidney? Yeah, I might be willing to give one of those up. But you had better fix me something good to eat in exchange. I don't feel that guilty. How about a flunitrazepam smoothie? tried to find your raspberry rose sorbet post, as it showed up in my google reader...did it somehow disappear? That is my next blog post, one that I'm still working on. I accidentally clicked 'publish' instead of 'save' and I had to quickly pull it down. Google reader ignores this action and torments everyone. I think we are both well aware that time-outs never worked on me. Orange and nutmeg sounds like an unusual and interesting combination. had labaratorio's mocha choco chip & maple walnut yesterday…treadmill today a must! What brand of ice cream maker do you use? I had one which didn't work well and have no idea what to buy. I also find homemade ice cream tends to be grainy. Is there a solution? I did note the powdered milk used in a previous recipe. I actually use a fairly inexpensive ice cream maker, a basic base model Cuisinart (link to model). I've owned or used several nicer ice cream makers, but found that there isn't much variation between home ice cream makers in terms of quality. (I stick with the cheapest Cuisinart model simply because I buy a need a half dozen spare freezer bowls and those add up quick!). Anyway, in the home setting, grainy ice cream may have less to do with the machine than the recipe and the method. 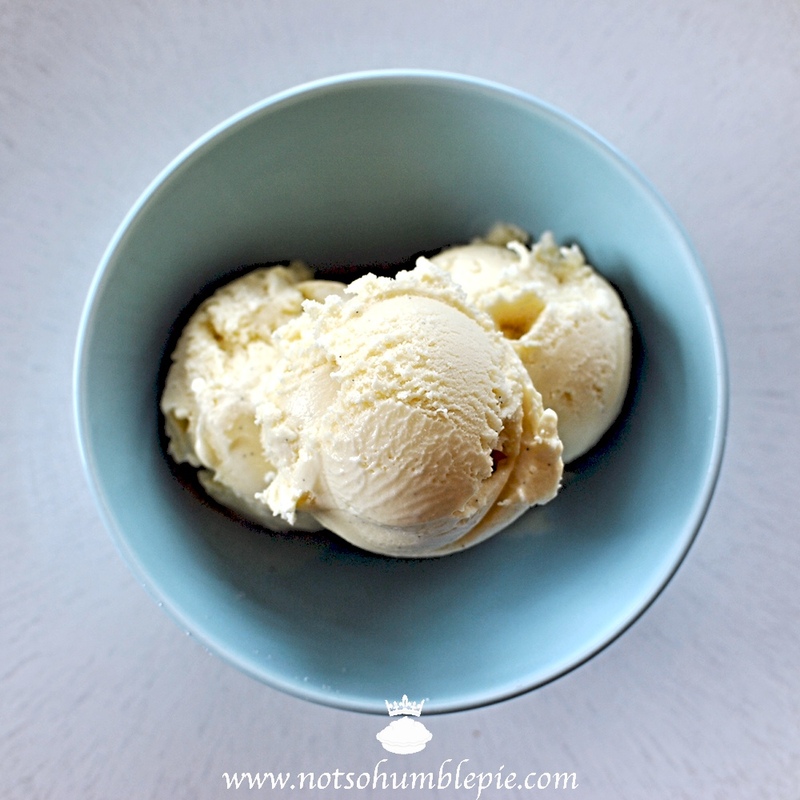 Even with my fairly basic ice cream maker, I churn out smooth creamy desserts (Yay, puns!). This is because I take a few steps to ensure the best results. 1. Make sure the freezer bowl (if your model has one) is very, very cold. Allow it to freeze for at least 24 hours before churning. Ideally let it freeze for 48-72 hours. 2. Make sure the ingredients going into the bowl are really cold. It can take sometimes 4+ hours for room temperature ingredients to properly chill in the refrigerator. By using cold ingredients, the churning is more effective and you'll beat more air into the mixture. The more air you churn in, the smaller the crystals that will form later on in the freezer. Couple 1 & 2 and you're well on your way to a batch of fine textured ice cream. 3. Further minimize those air crystals by using adding as much fat to the ice cream as you can (or can stand). In sorbets, it is an issue of sugar, as described above. I stick to recipes that use a lot of heavy cream vs milk. When I do use a higher ratio of whole milk, I will add the powdered milk to improve the texture. Otherwise I am just going all out, employing eggs, mascarpone, cream cheese, and 40% ultra heavy cream in my recipes. Fats don't freeze readily in home freezers. The higher the fat ratio the smoother the ice cream simply because it will have a tough time forming those pesky ice crystals. Before anyone mentions "...but butter freezes solid Ms. H!" I'll remind everyone that butter has a high water content. 4. Beat in a little air while mixing your ingredients. I'm not saying you should whip the cream, but a little air gives it a head start. When I call for you to blend all the ingredients in a food processor, one of the goals is not only to make the mixture smooth and homogenous but to add a air to the cream. This also applies when I talk about mixing with a whisk. The goal is to not only mix, but to incorporate a little air into the cream. 5. COLD! The quicker your churned ice cream freezes the better. Quick freezing prevents the large crystal formation that is so undesirable (grainy ice cream!). So stash that container of creamy goodness in the coldest part of your freezer.